AUBURN HILLS, Mich., May 20 -- On May 24, thirty-three drivers will rev up their engines during the first race of the Centennial Era at the Indianapolis Motor Speedway. The winner of "the Greatest Spectacle in Racing" will cruise down Victory Lane at the legendary Brickyard, earning a place in racing history as well as a place on the prestigious BorgWarner Indianapolis 500 Trophy(R). "From the founding of the Indianapolis Motor Speedway to the annual presentation of the BorgWarner Indianapolis 500 Trophy(R), BorgWarner is proud to be part of a century-long tradition of achievement, competitive performance and technological leadership," said Tim Manganello, BorgWarner Chairman and CEO. "We're looking forward to helping the Speedway celebrate its Centennial Era by presenting the BorgWarner Indianapolis 500 Trophy(R) to this year's winner in Victory Lane." Construction began on the Indianapolis Motor Speedway in March 1909. The first auto racing program was a three-day event beginning on August 19. Louis Schwitzer, an innovative engineer and founder of an early turbocharger business later acquired by BorgWarner, won the very first auto race at the Speedway, a two-lap, standing-start dash. As the Speedway was under construction, Frank Wheeler (one of four original founders of the Speedway) and George Schebler commissioned a trophy from Tiffany & Company on behalf of the Wheeler-Schebler Carburetor Company, which later merged with several other companies to become part of Borg-Warner Corporation. The sterling silver urn originally cost $8,000 and stood eight feet tall. At that time, it was the most expensive trophy for any athletic event in the world. The trophy was retired in 1932 when car owner Harry Hartz won it three times. When the Indianapolis Motor Speedway Hall of Fame was established in 1956, Hartz donated the historic trophy to the museum. In 1936, the BorgWarner Indianapolis 500 Trophy made its inaugural appearance at the Speedway when it was presented to winner Louis Meyer. Featuring the sterling silver visage of every Indianapolis 500 winner, the Trophy is a tribute to 100 years of racing history. Two new bases have been added to the original Trophy to make room for future winners through 2034. Made of over 100 pounds of sterling silver and standing five feet, six inches tall, the Trophy originally cost $10,000 and is currently valued at $1.5 million. 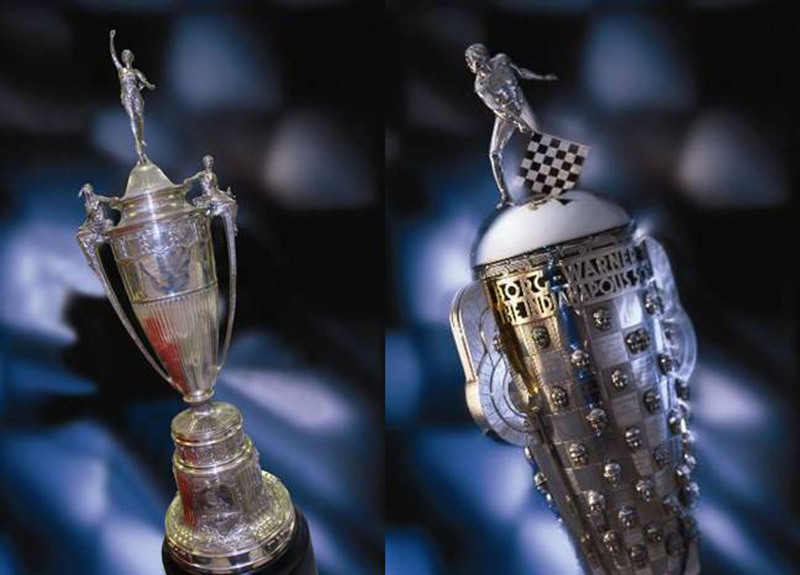 The BorgWarner Indianapolis 500 Trophy(R) stays on permanent display at the Indianapolis Motor Speedway Hall of Fame Museum. To give the winner and team owners a personal keepsake of their victory, BorgWarner established the BorgWarner Championship Driver's Trophy(TM) (also known as the "Baby Borg") in 1988 and the BorgWarner Team Owner's Trophy(TM) in 1998. Both are sterling silver replicas of the Indianapolis 500 Trophy(R). For more information, visit www.borgwarner.com and choose "The Indianapolis 500" from the "About BorgWarner" pull-down menu at the top of the home page.